NISA sent out an email today about taking preorders for Touhou Genso Rondo: Bullet Ballet. It’s apparently a full-HD remake, but I dunno which Touhou game it was originally. (It might not be one of the mainline series? It doesn’t mention ZUN anywhere and says it’s “set in the Touhou universe”.) It’s PS4-only, it seems, but there’s two-player functionality, so that could be fun. 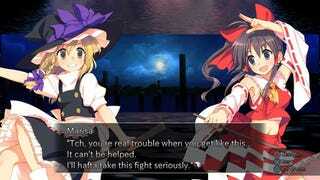 Previously, only the most recent mainline Touhou game (#14, ‘Double Dealing Character’) has come west, and it’s only on Playism from what I can find; it came out around this time last year.